When communities are devastated by disasters like earthquakes and nuclear explosions, how can they recover? In Fukushima, Japan, transformation may be the only option. 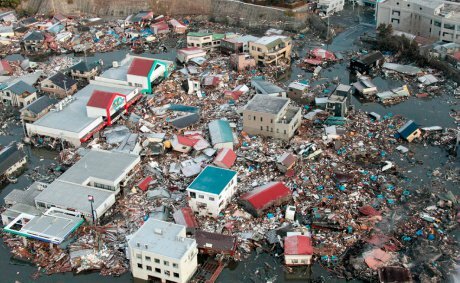 Kesennuma, Japan, after “3/11.” Credit: Reuters/Kyodo. All rights reserved. When the Great Northeast Earthquake struck Fukushima in Japan’s Tohoku region on March 11 2011, it triggered a tsunami that sent a fifty-foot wave rushing inland at over fifty miles an hour. In less than a day, nearly 18,000 people were dead or missing, and almost 300,000 were homeless. The old normal was gone. Today, communities in the region are struggling to reinvent their lives, but what will their future look like in a context that is permanently changed? For many, this is not just a matter of regaining property or livelihoods, it’s a profoundly spiritual question that centers on the meaning of happiness and the quality of life. The earthquake – widely known in Japan as “3/11” - toppled buildings across the region, but it was especially damaging in the coastal towns. In many places the ground literally fell away, dropping by three feet and more. The next day, three of the six reactors exploded at the Dai-Ichi nuclear power plants in Fukushima, while the containment structures for spent nuclear fuel rods were severely compromised at a fourth. Within a very short time, radiation forced another 60,000 people from their homes. This reactor, Dai-Ichi Four, is now one of the most dangerous places on the planet. Another large earthquake might lead to nuclear explosions that would force the evacuation of more than 20 million people. Contaminated water from the reactors at Dai-Ichi is leaking into the Pacific Ocean at an alarming rate. Containing the radiation and making the area safe again is beyond the reach of current technologies. But while people in California worry about nuclear waste reaching their shores five thousand miles away, those on the ground have more immediate concerns: they want to go home. What will it take to see these communities reborn, to call them back to life? The local context has changed beyond recognition, with some level of continued contamination guaranteed, along with large-scale depopulation (especially of younger people), and the disappearance of livelihoods based around nuclear energy, tourism, agriculture and fishing. Technical problems abound, and Fukushima is a mess - misunderstood, the object of endless fear-mongering and distortions, and exceptionally complex. The Fairewinds Project provides one of the most accurate overviews of the nuclear situation. But the underlying problems facing Fukushima are not simply technical, they are human: how to reinvent lives in a new and much more challenging reality. After a community meeting that I recently hosted at Renshoan in Fukushima, an older man approached me. Somewhat hesitantly he said: “I never thought the future was something I needed to think about. Tonight I have started, and I think, maybe, thinking about the future is the same as thinking about my happiness.” Trauma presents an opening for much deeper change. Indeed, in this case, transformation may be the only option. More than a thousand days have passed since the disasters. I have spent half of this time working with communities throughout the Tohoku region to create safe places for people to share their grief, explore new possibilities, and form partnerships with each other to create a different future. This has involved processes such as the Future Center model. Originally developed in Europe, it has now been adapted to the local context, along with ‘dialog technologies’ from the Art of Hosting like the “World Café”, open space, storytelling and appreciative enquiry. People in Fukushima live in one of three broad realities. Some are still overwhelmed with despair, since everything they know and love has vanished. Some would leave Fukushima in an instant if they had a way to relocate elsewhere. And others have declared that “this is our home, so we will make a new life here together.” They know that the past is gone and that an unknown future is waiting to be born. How can a community be recreated under such conditions? Most of the people in the region who want to move back home are aged over 60. According to a recent census in the village of Okuma, for example, almost 20 per cent of former residents want to return, and nearly all of them are elderly. Some children are also coming back, but at nowhere near the population densities of the past. Their old school system cannot be re-created, and even if it could, it wouldn’t teach what students need to learn in order to live in and create a different Fukushima. Houses, shops and fields all lie empty. The economy has collapsed. And the tsunami clean-up efforts that have taken place outside the radiation zone have left Fukushima almost untouched. What's more, not all parts of the region are open for resettlement. Radiation levels vary almost street-by-street. But if the Japanese Government decides that it is safe to move back, those affected will lose their “radiation compensation,” the funds that are paid by government to those who have been forced from their homes. This would leave people who are mostly farmers with pensions of just a few hundred dollars a month. The stresses and strains of being without a permanent home for the last three years are exacerbated by tensions surrounding the varying levels of financial support that different people receive. In this situation it is even more difficult to develop the trust that’s required to rebuild community. As people do move back, questions remain as to what to do with the nuclear waste that is aggregated during the decontamination process. Government contractors are currently at work removing the top six centimeters of soil which contain radiation. But where will this waste be stored? This process also removes fertile soil from the fields at the same time. What about “bioremediation,” which research suggests is a better alternative - leaving the soil in place and using mushrooms and other plants that ‘eat’ radiation for their lunch? Who makes these decisions? Faced by these questions the obvious answer, say some, is that everyone should be forced to move elsewhere for good. But where is it safe? Communities in Fukushima probably know more about radiation than most people on the planet, but still there is no certainty. Epidemiological research from Hiroshima and Nagasaki about the impact of low-dose radiation is inconclusive: we don’t know why some people get sick while others are unaffected. Those who are returning have made their decision, yet they know that their lives will never be the same. While there are certainly complex technical issues associated with the nuclear reactors, the deeper questions they face are very human. What will this new society be like? What does it mean to have a population that is overwhelmingly elderly? What kind of economy will sustain the region now that previous livelihoods have disappeared? What is possible now that was not possible before? These questions are slowly becoming more visible as people like Kamada-san and Kanno-san step forward, holding their grief and their dreams and confronting an uncertain future together. But this process will take decades. I get annoyed these days when people use the image of a caterpillar and a butterfly as a metaphor for transformation. There’s almost something glamorous about everything dissolving into ooze, only for beauty to reemerge. The transformation of people’s lives in Fukushima is very different. This transformation is one of ordinary people who are raising their voices and using their hands, reaching out to each other, taking one step forward and then another, to build new lives in a place that they call home.